Is The Dr Oz Weight Loss Diet Better Than The Beyond Dark Chocolate Diet? It is possible that the Dr. Oz diet may help you lose weight before your wedding. 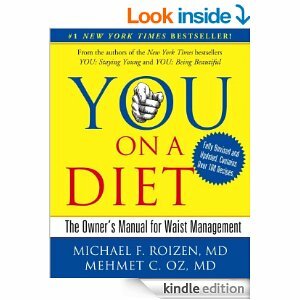 Dr. Mehmet Oz is the face behind the uber-popular Dr. Oz “You on a Diet” book, which has reached the top of the New York Times Best Seller’s List. This diet plan does not waste any time in getting started. Basically it requires an individual to clean out their refrigerator and pantry and restock both with healthy options. The foods you are able to eat in the diet plan are very limited, so it is really important that you create a specific grocery list and stick to it. While you might get bored with the monotony of the limited food choices and selection, all the food choices are healthy and nutritious. One part of this diet plan that many individuals enjoy is that you are able to eat out at your favorite fast food retaurant on occasion. The Dr. Oz diet also incorporates a recommended exercise fitness plan. Everyone following the Dr. Oz diet must take a 30 minute walk each day and complete moderate physical workouts three times a week, for a minimum of 30 minutes. It makes sense that the Dr. Oz diet does incorporate healthy eating and exercise. There are 5 “pillars” of the Dr. Oz diet that must be followed in order to ensure success. 1) Healthy snack foods must be available to ward off cravings and hunger pains. 2) Don’t eat food within three hours of bedtime. 3) Make sure you eat only until your stomach feels full and don’t allow yourself to be stuffed. 4) Switch to a smaller plate to exercise portion control. 5) Make sure you only eat dessert every other day. These “pillars” are constructed from sound and medically recommended advice, but there is nothing new or revolutionary to them. However, the Dr. Oz diet does recommend measuring one’s waistline each day instead of weighing one’s self on a scale. I think this is a great option instead of a daily weigh in.The theory behind this action is that the numbers on a scale can often fluctuate wildly, cmaking you think the Dr. Oz diet is not working. The Dr. Oz book is quite affordable, and is available on Amazon.com, it can be purchased for less than $18.13; however, a purchaser of this book should be aware that they will be buying what most consider to be common knowledge. Others may find the cartoon illustrations of the book to be silly. cover of the Bariatrician, The American Journal of Bariatric Medicine. This cacao based protein shake is a filling meal replacement that is also very healthy. One serving is 21 grams of protein, over 56,000 ORACfn (amount of antioxidants) and tastes yummy. They have many great recipes including one with 1/2 frozen banana, 1 tsp. peanut butter, 1 cup ice, 1 cup water and 2 scoops of the protein shake. In the study included in the Bariatrician, the average participant lost 31 pounds in just 12 weeks and lost over 5 inches around the waist. In addition to two meal replacements, you could have two snacks including Beyond healthy dark chocolates and a healthy dinner. Exercise was also important as was drinking water. Exercising a minimum of 20 minutes a day is recommended and can be as simple as a walk or a bike ride. I have lost well over 50 pounds on this Chocolate Diet and I love how the shake makes me feel full for up to 4 hours. I also like the energy I feel after consuming the XO LIfestyle (Beyond) X-Protein Meal Shake. More information on the protein shake is available at ChocolateDreamDiet.com. You can also reach Lynette Henk at 941-216-5727, at [email protected] The choice is up to you. My personal choice is chocolate. “Every Diet Has A Dark side, Ours Is Chocolate” is their motto. 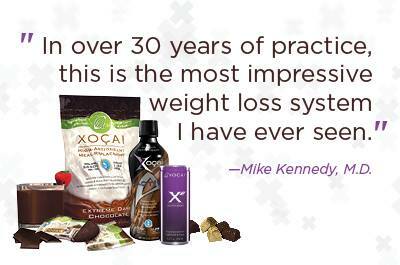 Healthy Chocolate Protein Xe Weight Loss Lifestyle Value Pack-Diet Plan Featured in Medical Journal!